Obituary – Queen, Ruth Eleanor (Lindeman) « Perry High School Alumni Association, Inc.
Ruth Eleanor Queen was born on July 24, 1921 in Perry, Oklahoma and was the daughter of Fred and Carrie Lindeman. She passed away on Sunday, February 13, 2011 in San Juan Capistrano, California. She attended and was a graduate of Perry High School. She also attended a 2 year business college in Oklahoma City. Ruth was employed at First Bank and Trust in Perry for over 35 years as a teller and an officer at the bank. Ruth married George Queen on June 11, 1976, at St. Rose of Lima Catholic Church. He preceded her in death in October, 1993. 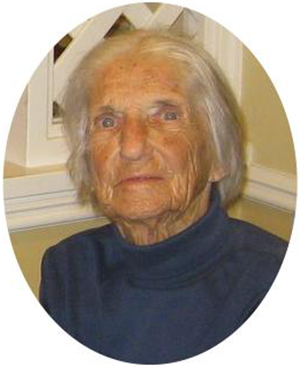 Ruth was an avid walker and participated in the Cherokee Strip 5K Land Run until the age of 81. Throughout the years she was in various clubs and organizations in Perry such as the Perry Garden Club, Bridge Clubs, serving at the Lions Club luncheons, worked in the church helping with Vacation Bible Schools, balancing donations and making deposits, and giving communions to those in the nursing home. She was a friend to many and was always willing to help those who needed assistance. She also enjoyed visiting her sister and family in Houston, Texas and her son in Laguna Niguel, California. The Lindeman family was well known in the Perry community. Her parents owned several farms in the Perry area and operated the Lindeman Grocery Store located on the south side of the square. A rosary will be held at 7:00 pm Friday, March 18, 2011 at St. Rose of Lima Catholic Church. A Mass of Christian Burial will be at 10:00 am Saturday, March 19, 2011 at St. Rose of Lima Catholic Church. Father Dan Letourneau and Father Lowell Stieferman will officiate. Inurnment will be in St. Rose of Lima Catholic Cemetery. Services are under the direction of BrownDugger Funeral Home. Memorials may be made to the Oklahoma Medical Research Foundation in care of BrownDugger Funeral Home, 1010 N. 7th Street, Perry, Oklahoma, 73077. Ruth is survived by her son, D.C. Eby of Laguna Niguel, CA and his wife, Kathy, one grandson, Mark Eby of Wichita, KS, two greatgrandchildren, Blake and Brooke Eby of Wichita, KS, three nieces, Rebecca Hillis of Oklahoma City, OK, Mary Jane Hardin of Houston, TX, Elizabeth Nutt of Brenham, TX, and three nephews, Rick Craft of Oklahoma City, OK, Jonathan Hardin of Thibodaux, LA, and Fred Hardin of Nashville, TN. She was preceded in death by her husband, her parents, her sisters, Mary Powers, Lucile Sidy Craft, and Philamene Hardin, and one nephew, Mark Craft.